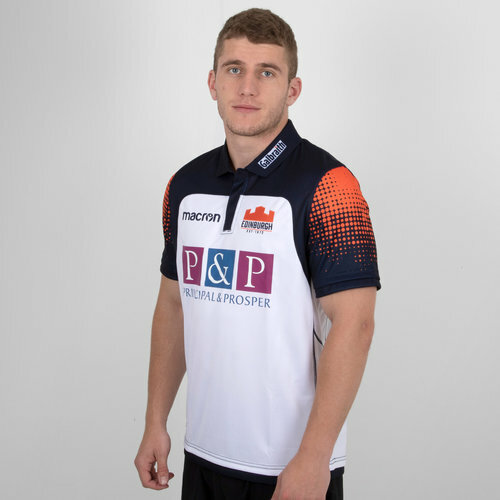 As one of only two professional rugby teams in Scotland make sure that you show you're a fan of the team from the capital rather than the team from the most populous city in this Edinburgh 18/19 Alternate Pro S/S Rugby Shirt from Macron. Edinburgh from the Guinness Pro 14 became the only Scottish club to reach a major European final when they squared up to Gloucester Rugby in the Europea Rugby Challange Cup back in 2015. Now, this season they look set to be on of the teams to watch. They have collaborated with sports brand Macron to bring their fans a new kit and training range for this 18/19 season. And, just like the season they are expected to play, they have a striking kit to match. 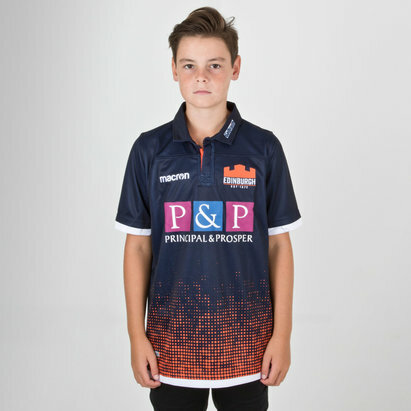 This new campaign coincides with the restyling of the club's logo which mixes their traditional navy and white colours with the modern addition of orange. The alternate jersey is body fit and the main fabric is Armevo. The shirt is predominantly white with navy blue detailing and trim around the sleeve cuffs and around the base of the garment. Inside the polo collar, is an orange tape detailing the year of the city’s first representative match in 1872. The Macron logo is on the right of the chest with the club’s rebranded logo - which represents the turrets of Edinburgh castle, the volcanic origins of the city and the year of the city’s first game – on the left. The same orange colour is in the graphic pixel detail on the sleeves of the jersey, taking inspiration from the volcanic lava which went on to form the bedrock of Scotland’s capital city. The team's sponsor - Principal and Prosper - is across the middle.